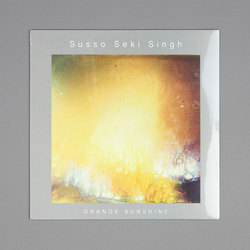 Susso Seki Singh - Orange Sunshine. Vinyl LP. Bleep. The newly founded Painted Word label drop their second release from the cross-continental trio Susso Seki Singh. This beautiful, summery hybrid of harp, kora (West African loot instrument) and santoor (hammered dulcimer) marks an incredible marriage of cultures and manages to carry a strong atmosphere throughout the album whilst electronic pulsations permeate tracks like ‘Night Drive’ to add a contemporary edge to things. As we write this we’re drifting away to ‘Edge of Time’ while staring at the birds circling around a church tower in the distance. It’s 30 degrees and the sun is shining and everything is going to be alright.